VitalTwist Turmeric Curcumin Review – Is This Product Safe To Use? Not many things can influence your quality of life as joint pain. It affects both your mobility and mood and makes even the simple activities extremely challenging. Fortunately, there are supplements that can make this pain more manageable, but is VitalTwist Turmeric Curcumin one of them? That is what we are about to find out in this review! What is VitalTwist Turmeric Curcumin? VitalTwist Turmeric Curcumin is a natural dietary supplement that aims to fight inflammation throughout the entire body. The product promotes joint health but also supports the digestive system, immunity and brain function. It is based on a superfood called turmeric that we all know very well. If you are looking for a natural way to fight the inflammation in your joints or another area of your body, this supplement might be for you. 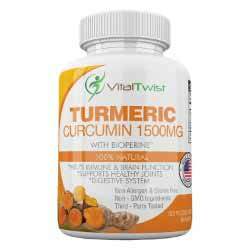 You can purchase VitalTwist Turmeric Curcumin only in the form of tablets. The supplement focuses on a long-term benefit and promotion of joint health, immunity, and your overall health. What is the Company Behind VitalTwist Turmeric Curcumin? The name of the company that makes the product is VitalTwist. The company is registered in California, United States, and hasn’t been around for long. For now, they are focusing on several supplements that aim to improve your overall quality of life. Aside from the Turmeric Curcumin, they also manufacture Probiotic 40 Billion for digestion, Omega-3 Fish Oil for general health, and Garcinia Cambogia for weight loss. According to VitalTwist, the mission of the company is to enable vitality, health, and lifestyle to come to your home. How Does VitalTwist Turmeric Curcumin Work? As the name suggests, VitalTwist Turmeric Curcumin aims to utilize the potential effects of turmeric, which is a plant that belongs to the ginger family. The product is orally ingested and focuses on long-term benefits for joint and overall health. Regular intake of the supplement should, according to the manufacturer, boost your body’s inflammation response in a natural way. That may, in turn, help to reduce joint pain and promote general joint health. The manufacturer claims that the product is free of GMO, gluten or other allergens. The ingredients’ list is not very long and the active compounds are rounded up with an additional dose of curcuminoids and BioPerine. The company believes that the latter one improves the nutrient absorption and boosts the effectiveness of the product. What are the Ingredients Used in VitalTwist Turmeric Curcumin? Turmeric Root Extract – Turmeric is known for its potential anti-inflammation effects. It may not only reduce joint pain and stiffness, but it can also promote your overall health. What are the Pros of VitalTwist Turmeric Curcumin? What are the Cons of VitalTwist Turmeric Curcumin? You should take two capsules of VitalTwist Turmeric Curcumin on a daily basis. Make sure to take them with one of your meals for optimal results. How Much Does VitalTwist Turmeric Curcumin Cost? The current price of a single bottle of the product is set at $20.49. At the moment, you are eligible for a discount if you purchase multiple jars of any supplement made by this company. It is a fairly recent product, so you won’t find many reviews for VitalTwist Turmeric Curcumin. Those that we were able to find were mixed. Some customers were glad that they have added the product to their nutrition regime and specifically praise that it doesn’t contain allergens or GMO. On the other hand, several users expected more and revealed that the product is nowhere near as powerful as the manufacturer claims. VitalTwist Turmeric Curcumin can help to stimulate natural organism’s inflammatory response, but it might take a while to experience any potential benefits. The plus sides are that the formula is free of GMO and allergens and the ingredients may have anti-inflammatory properties, but it could use a couple of extra ingredients, especially those focused on promoting joint health. While VitalTwist Turmeric Curcumin may be helpful when it comes to joint pain relief, it is not its primary objective. There are other alternatives on the market that you should check out before making a decision to be completely certain about your purchase.